Amanda Amico's got a lot on her plate. She's the general manager of the Swan Sweet Diner, and she's also a new mom. Both she and her wife work fulltime. So, daycare conversations began early in their household. Sweet Home opened in 2004. Reps for the daycare said they had a waiting list for its infant room almost immediately. Sweet Home works with families to place them in a nearby daycare until a spot becomes available. Earlier this month, it also added another infant room. That created eight additional slots for working parents like Amanda Amico. “I like knowing that she's close by if anything's needed. Also, it's convenient for drop off. It makes it easier when you know there's good people taking care of her,” Amico said. 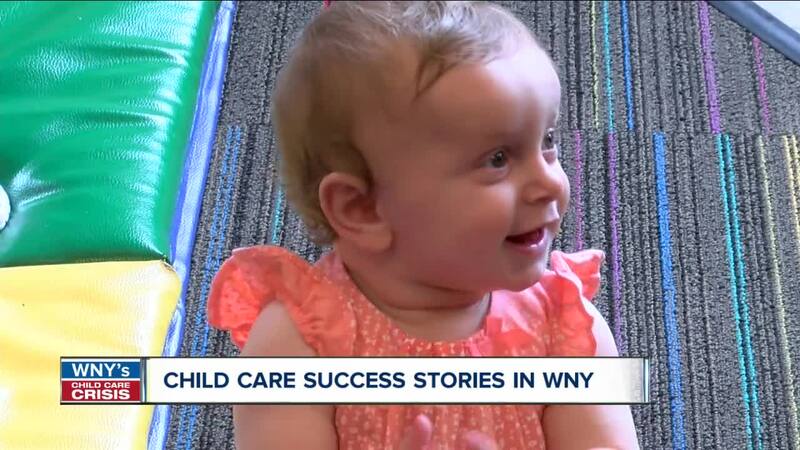 Rich Products is also making child care more accessible for its employees. It opened a day care in the 1980's for its employees. "It was just such a huge help to have them here, have them on site and under the same roof," said Rich employee, Jon Zirnheld. "It's a point that attracts people to our company, and I can tell you for sure it's a point that keeps people with Rich Products, and I'm very grateful for that," said Rich Products Executive Vice President, Ed Moore.